Grand Theft Auto 2 (1999) is the second game of the famous Grand Theft Auto series by Rockstar North Ltd. (at the time known as DMA Design Ltd.) and published by Rockstar Games. It retained the top-down action gameplay of its predecessor, with several quality-of-life improvements such as a functioning health system and game saves, as well as graphics that don't look like a remnant of the Amiga age. The game was originally released for Windows in complete form, and for the PlayStation with various features cut and other aspects censored. Later on a Dreamcast port was also released which is gimped in other ways, and a Game Boy Color port that nobody will care acknowledge the existence of. The protagonist of the game is Claude Speed, career douchebag and unscrupulous criminal worker with chronic backstabber syndrome. Claude Speed comes to Anywhere City, USA, to do work for gang bosses, wreak havoc, and get enough money to leave the district again. (The work part is optional, the wreaking havoc part is also optional in the most technical sense, the money part is not). There are a total of 7 gangs in the game - three per district - and each gang in each district has a total of 7 missions for the player to complete. Clearing all missions in a district causes each gang leader to catch on to the fact that you've been backstabbing them, and they will attempt to personally murder you, so then you can front-stab them too. Additionally, each district has 50 tokens to collect (except the PSX version has 25 tokens because the PSX port is crap) and 20 Kill Frenzies, side missions where you have to kill a certain amount of people within a time limit with a particular weapon. This run aims to beat the game as fast as possible, with no restrictions. The primary completion objective of each district is to earn enough money ($1 million in Downtown District, $3 million in Residential District, and $5 million in Industrial district) and then reach the end-of-district exit point. Clearing Downtown gives access to Residential, clearing Residential gives access to Industrial, and clearing Industrial returns a "game complete" screen. With the key goal being simply to get enough money, this is where certain tricks come into play. All that really needs to be done in each district is to set up money-making tricks, generate enough money until it's possible to complete the district, and then reach the exit point. More on this will be detailed below. As with any sandbox game, and any Grand Theft Auto game in particular, this game is stacked with randomness. Pedestrians are randomly spawned, of random types, walking in random directions. Cars likewise are spawned in random positions, with random types, driving in particular directions. This must be optimally used to the player's benefit in any TAS - getting in the most optimal car possible, at the most optimal time and position, manipulating pedestrians wherever they will be beneficial, and so on. This is doubly important in the PSX version, because it features significantly less ped and car spawns than other versions, because the PSX port is crap. Most generally, pedestrians and cars can be manipulated by the player's position (or particularly, the camera, but the PSX version has no manual camera control because the PSX port is crap). Walking at slightly different angles of positions can often decide that a different car spawns somewhere, or that the same car spawns at a different position, or even that the same type of car spawns but with a different color or something. All kinds of subtle changes are possible. There are dozens of car types in the game, but only a handful are actually relevant for the level of play we work at because most of them are simply too slow and have no use compared to faster cars. GT-A1 450 Only available in single player as a collectible (not drivable) in the Residential District. Only drivable in multiplayer. Not available at all in the PSX version, because the PSX port is crap. SRS Meteor 420 Gang car of the SRS Scientists, only available in the Residential District. Never used or considered in the run because Scientist territory is never entered. Furore GT 416 Available in the Residential District. Fast acceleration, high top speed and high turn speed make it excellent for TAS driving purposes. Cop Car 415 Available in all districts. Fastest available car in the Downtown and Industrial districts. Since they belong to cops, any ones driving around are locked and cannot be simply carjacked, but with a wanted level you can essentially lure the cop out of the car anyway. Z-Type 405 Gang car of the Zaibatsu, available in all districts. Good car, but the run never reaches a point where a new car is needed and the player is in Zaibatsu territory. T-Rex 405 Available in the Residential district. Slow acceleration compared to other high-end cars. B-Type 401 Available in all three districts. Fastest non-special car in Downtown and Industrial districts. Stinger 401 Available in the Industrial district. Rumbler 401 Available in the Industrial district. Relatively slow acceleration in third gear. Hachura 400 Available in the Residential district. Jefferson 400 Available in the Industrial district. Generally speaking, the Furore GT is the best car in the Residential District (with exception of the Meteor, which is only available in Scientist territory), although the Cop Car can have situational uses (like being faster to enter with the instant car entry trick). In other districts, the Cop Car is the fastest available car. When carjacking, opening the car door and taking out the driver are all separate actions that take time. These actions can both be skipped if the car door is already open, saving not only time entering the car, but if the car is moving, it can save time through conserving momentum as well. A common application is with cop cars - if the player has a wanted level, and a cop car approaches, the cop will leave the car. Carjacking the cop car when the cop opens the door causes Claude to enter immediately, allowing him to drive off with no delay. This is faster than regular carjacking in a lot of cases. When Claude dies in the game, he respawns at the nearest hospital. This can be used as a beneficial shortcut. However, if Claude dies in close proximity to a hospital, he will deathwarp to another hospital instead. This can also be used as a beneficial shortcut. This is the main trick that makes this run possible - a way to rack up money very quickly, rendering the district completion objectives trivial. Expeditious Execution is a bonus awarded to the player if they can manage to kill many pedestrians in a short amount of time. The requirement is 20 pedestrians (or 12 peds in the PSX version because the PSX port is crap) being killed in less than a half second from each other, and this gives a $100,000 bonus. Normally this is very hard to reach without some sort of setup, but there's a different way, which is where the glitch part comes in. Some unusual interactions can happen if a pedestrian is run over by a car while he is in a drowning state. Depending on a few factors, like whether the car is touching land, or another car, whether it is moving fast or slow, etc., a car can get stuck on top of a drowning pedestrian, triggering a loop where the pedestrian ends up being killed every frame. Every time the ped is killed, if the player is in the car running over the ped, it will not only give money to the player for the kill, but will also rapidly fill up the Expeditious Execution counter, and constantly award the player the bonus. This means earning $100,000 multiple times per second, adding up to the money count required for district completion very quickly. It should be noted that as situations where the EE-glitch is active vary, how fast the process goes varies as well. For example, if the player's car is close to a wall, it will significantly speed up how fast the EEs are added up. This is why the EE-glitch setup may look a bit awkward in some places - as just pushing a ped into any body of water and following up can result in a slower flow of EE money, if it even works at all. It also often happens that a EE-glitch setup just does not work, or only briefly works before the car either loses speed and sinks, or gets detached from the ped and flies off into another body of water before sinking. This can be influenced also by the player accelerating or steering while the glitch is active - an important aspect for optimization is not only getting the glitch set up, but also making sure that a clean speedy exit (suicide) is possible. Walk to the east to the road and carjack a B-Type. Drive to Futuro FM in Zarelli to the north to an area where the EE-glitch can be performed. Lure a pedestrian to the bridge, push him off, and perform the EE-glitch on him. Player exits the car, falls into the water, and gets wasted after enough money is obtained. Walk south to the road and carjack a Beamer. Drive to the exit point. Right at the start, there are various possible directions to get to the road. North takes far too much walking time, west takes a little too much walking, south and east are very close but east results in a better route towards the northern destination. West and south both only took less than a second longer than east in testing, illustrating the fine margins that routing can have in this game. South probably would be faster in the PC version because it would be possible to do the tutorial call and spawn a Schmidt (and a pistol). However, in the PSX version this takes several seconds because mission phone calls have multiple seconds of delay, because the PSX port is crap. I tweak my walking path very slightly to manipulate for a B-Type on the first lane of the right side road, at the right vertical position so I can approach and carjack it right away. A car on the left-hand side would take too long to turn around. A B-Type is the most optimal car in this situation - it's the second fastest car that can spawn here besides the Cop Car, and there is no fast way to enter a cop car without a weapon, a pedestrian cop, or anything else that can trigger a wanted level. There is only one area in the whole district that has unwalled access to bodies of water, and it is the Futuro FM headquarters in Zaibatsu territory, up north of the starting position, normally only entered for the Radio Za-Za mission, although it is open at all times anyway. That means that this is the only location in the district where the EE-glitch can be set up. While entering the area, a ped is manipulated to spawn at the northern-most possible position, to minimize running time to the open-water bridge. Then the ped is pushed off and the EE-glitch is executed. After the required amount of money is reached, Claude steps out of the car and drowns immediately, respawning at a hospital not far from the exit point. The fastest car that could be manipulated here is a Beamer - not a top end car, but still reasonably fast (377 top speed) and good acceleration. Faster cars would have taken too long to manipulate here and would lose time in the end. The Beamer is driven into the exit point, and the district is completed. Go to the west to the nearest road, and jump into a Stretch Limousine to get wasted. Death warp to the hospital near the southwestern corner of the map. Walk north-east to the road, punching a pedestrian Cop along the way to get a Wanted level, attracting the attention of a Cop Car, which is carjacked at 4. Drive back south-west to the shore, push a pedestrian off the shore, and perform the EE-glitch on the pedestrian at location 5. Player exits the car and gets wasted after enough money is obtained. Death warp to the other hospital, near the center of the map. Walk south-west to the road and carjack a Furore GT. 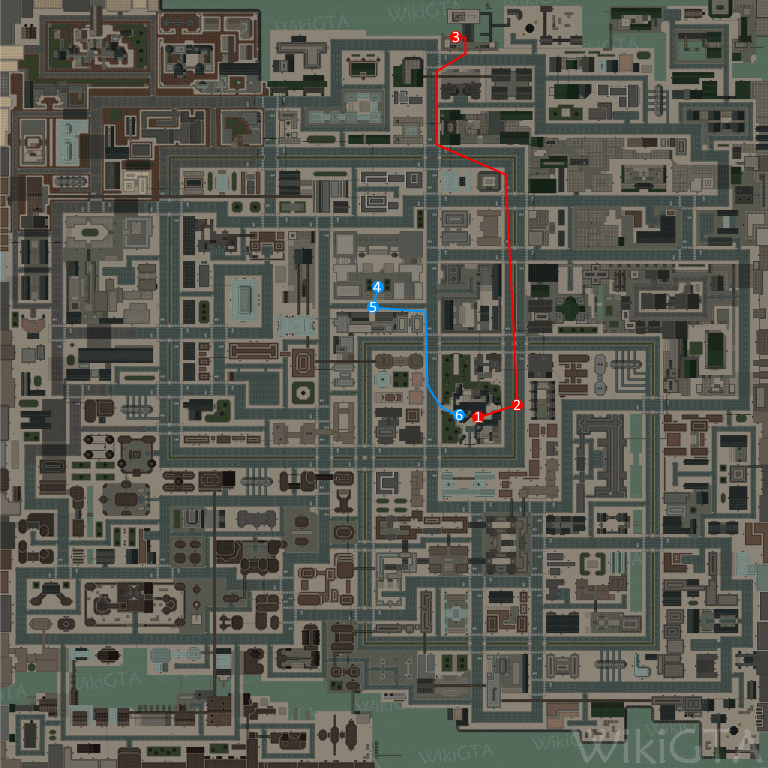 In the PC version, the starting point features a parking place with an Arachnid car, members of each gang firing at each other, and a train station just to the east. All of these were removed in the PSX version because the PSX port is crap. This means that the RTA standard death warp is not possible (normally the Zaibatsu gang member would be used to get shot at and killed by), so instead I do an alternative deathwarp with a limousine spawning on the road, which is not quite as fast and is also way less consistent in real time. Also, quite a few western shore areas that are not walled in the PC version are instead walled in the PSX version, because the PSX port is crap. Fortunately, the death warp does send Claude to an area that is not quite walled off still. On top of that, the Medicar at the hospital spawn point is removed (as well as every other parked car (except for Kill Frenzy cars) ) because the PSX port is crap. This means that a car needs to be manipulated to do the EE-glitch with, as opposed to the RTA route that can do it trivially with the Medicar, and with a set of slopes that was also removed in the PSX version for some reason because the PSX port is crap. Some tricky manipulation movement is done not only to get a Cop Car to spawn on the nearest lane, but also to spawn a pedestrian cop along the way (and also to spawn a ped in the optimal position for the EE-glitch). Punching the pedestrian cop gives Claude a wanted level, causing the Cop Car to chase after Claude, leaving his car, and allowing Claude to enter it (also making use of the instant car entry trick). The cop car is used for another EE-glitch. Afterwards, a death warp is done again, but to the other hospital - all the way on the other side of the map, much closer to the exit point. A Furore GT is carjacked in order to drive to the exit point. A Cop Car was ruled out here because it was not possible to spawn a ped cop in a near enough area, and a weapon would've taken too long to get. The Furore GT is a fine car anyway, and its superb cornering abilities prove beneficial near the end to enter the exit point quick. The exit point in this district is very finicky, and it takes a while for the game to register that the player has entered the exit zone. This took quite a while and many different takes to optimize. Walk south and then east to the road. Punch a pedestrian Cop along the way to get a Wanted level, attract the attention of a Cop Car, and carjack it. Drive to the docks near the north of the map, push a pedestrian off the shore, and use one of the docks to perform the EE-glitch on the pedestrian. Player exits the car and gets wasted after enough money is obtained. Death warp to the hospital at the north-east side of the map. Grab a S-Uzi Machine Gun located here. Walk north to a road, shoot the gun near the presence of a Cop Car to get a Wanted level, and carjack the Cop Car. Drive to the exit point to beat the game. Again, a Cop Car is jacked by triggering a wanted level by punching a pedestrian cop. Most of the north coast is available for EE-glitch setup (with the exception of Mad Island, which was completely removed in the PSX version because the PSX port is crap, as well as some areas next to where it was located). However, for optimal EE-glitch usage, it is still needed to push off a pedestrian next to a dock, to trigger a more efficient version of the EE-glitch. After deathwarping to the hospital, there are two possible roads to go to - north to a small road, or south to a large six-lane highway. The highway would seem better, but there's a larger minimum time before cars start appearing close enough, and the path to the small road is slightly shorter, so the northern road actually turned out to be slightly better. The difference here is, once more, less than a second. One of the routes I tried out involved skipping getting the machine gun and getting a Stinger from the bottom road instead, but again it was only marginally slower. The machine gun at the hospital is used to alert the cops and get a wanted level this time. Manipulating a pedestrian cop here appeared to be impossible, after lots of attempts. One final drive to the exit point, and game complete! In-game frame counter: Frame count as internally counted by the game. Adds up 1 per frame of gameplay. Resets for every district. Can be made visible on the PC version through a debug cheat, which is used for RTA timing for individual district runs. Real time: First non-black frame at the start of gameplay to first black frame at the end of gameplay. An alternate movie file for publication purposes is available here. This movie file enters the credits as soon as possible after the end screen. Thanks to the GTA2 speedrunning community - particularly, Tezur0, WordofWind and Molotok for their speedrunning streams and resources. Thanks to you for reading this and watching the movie! feos: Replacing the movie file per author request, with one that ends input earlier. feos: Astounding movie, nothing to even imagine as questionable unless I've gone insane from enjoyment. Accepting to Moons. Note to the publisher: use the file linked above that reaches the credits. Spikestuff: Can we go bowling after this?